Unless they’re flea market regulars, modern Americans are not great at haggling. It’s why we hate car shopping so much. Most of us want our prices posted on the wall or on a little sticker, and that’s all. 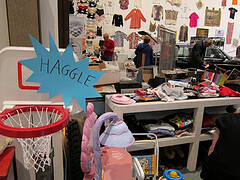 But simple haggling can save a lot of money, and it can be relatively painless. You just have to say seven words. It doesn’t hurt. Best-case scenario: the person you’re buying from will make a counter-offer. Worst-case scenario: they will say “no,” but won’t cancel the deal. You didn’t say anything aggressive or unoffensive. It can even work with small online merchants, who may be willing to lower prices if you buy a large quantity.